SEBI has clarified that foreign venture capital firms incorporated outside India can now register as Foreign Portfolio Investor or FPI inorder to initiate investments in India startups. However, this is subjected to certain terms and conditions. This clarification was made by SEBI for all Foreign Venture Capital Investors (FVCI). 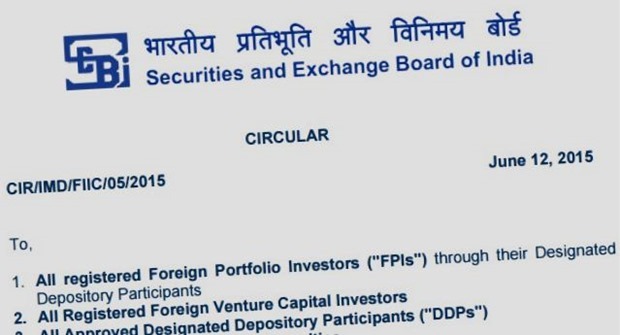 Recently, an unnamed Designated Depository participant (DDP) asked SEBI whether FVCIs can register themselves as FPI or not; and what are the restrictions and conditions for the same. In a response to this enquiry, SEBI came out with a new circular wherein it has provided detailed clarification regarding this issue. FVCI are investors incorporated or established outside India who can invest either in a Domestic Venture Capital Fund or a Venture Capital Undertaking (Domestic Unlisted Company). Whereas FPI are foreign investors, such as FIIs, sub-accounts and Qualified Foreign Investors who can bring in liquid assets from foreign locations, park it inside India and then invest in high risk portfolios. Achal Singh, Deputy General Manager with SEBI has made clear that this circular was issued in accordance with Section 11(1) of the Securities and Exchange Board of India Act, 1992; wherein information was conveyed to protect the interests of investors, and to promote the growth of the securities market. At the same time, SEBI has informed that the regulations pertaining to FVCI and FPI are completely different, and all FVCIs must adhere to the separate rules in order to invest in domestic companies. There should be separate accounts for both FPI and FVCI, and a custodian must maintain the same for executing investments. However, same custodian can monitor both the accounts at the same time. You can view the circular issued by SEBI regarding registration of FVCI as FPI here; and for more information about regulations pertaining to FPI, you can visit here.